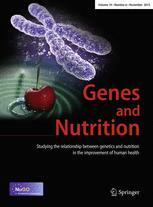 Genes & Nutrition is affiliated with the European Nutrigenomics Organisation (NuGO). NuGO is an association of universities and research institutes focusing on the joint development of the research area of molecular nutrition, personalized nutrition, nutrigenomics and nutritional systems biology. Articles: Propelling the paradigm shift from reductionism to systems nutrition Autors: Jim Kaput, Giuditta Perozzi, Marijana Radonjic and Fabio Virgili This is open access. This editorial describes Genes and Nutrition’s suggested scientific guidelines for publication with a summary in Table 3. Additional details for authors are: https://genesandnutrition.biomedcentral.com/submission-guidelines.